Whether you are just starting-up, or whether you have been running your small business for decades, effectively managing your existing customer base AND nurturing prospects into new customers, is at the core of running a successful small business. 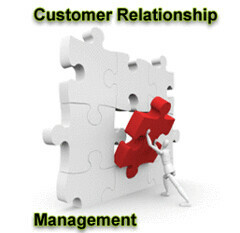 The term Customer Relationship Management (CRM) was coined to describe using a technology solution (i.e. some type of software) to manage a company’s interactions with customers and prospects. A CRM system can be as simple as an Excel spreadsheet containing customer contact information. There are also numerous dedicated CRM software offerings available that can be run locally on your computer, or run in a collaborative environment on your servers so that all of your team members can access and contribute to the same database. And, there are a number of Software as a Service (SaaS) offerings, such as market leader Salesforce, that provide online access to the application and your data from any Internet-enabled device. If your small business is just starting out, you may not have the budget or need for a full-featured, complex, and expensive CRM solution. You may even have a one-person sales team, or sales may be one of your many responsibilities. In that case, you don’t even need to invest in a shared environment—you just need a simple program that will enable you to save prospect information, schedule follow-up activities, and track sales. If that’s the case, give the free EQMS Lite 2014 from Spinso a try. It supports only one user, but has most of the basic features you’ll need. The software enables you to create a catalog of goods and services as well as a list of lead sources. You can then enter Enquiry/Lead records which include customer contact information, how the lead was generated (web search, radio, phone, etc. ), and the products/services they are interested in purchasing. After creating an Enquiry, you can attach follow-up tasks to it. Finally, you can close the Enquiry as a booked, lost, or cancelled sale. The basic reporting feature lets you view Enquiries based on lead name or product interest, and the Status report includes details based on close status. Reports can be exported to Excel for additional analysis. The Follow-up screen lists all your open tasks, and updates as scheduled tasks become active or are completed—which is very helpful in planning your sales day. The EQMS Lite 2014 program has many drawbacks, most notably it does not let you create multiple Enquiries under a single Customer Record, but it does let you store an unlimited number of records, and it is very simple so you can begin using it with almost no learning curve. There are some annoyances too, like having to click a “log-in” button (which actually does not require user credentials) and accept the terms each time you start the program, and being taken to the Spinso website each time you close it. However, if you’re just dipping your toe into CRM, it is a good place to start. When you’re ready to take the next step and invest some more time in learning a full-featured CRM application, or if you need a multi-user solution as your sales team expands, try a free version of an online SaaS CRM package. These solutions offer valuable tools like creating company and contact profiles, collaboration, pipeline management, integration with Outlook, Google Apps, and other productivity software, calendars, integration with your website, encryption, and more. However, as the programs are more complex, they require a bigger time investment to learn, to use, and to learn to use well. Insightly offers a free 3-user version that includes up to 2,500 Contact records. FreeCRM offers a free 5-User version that includes up to 2,500 Contact records and 30 minutes of integrated Voice CRM (VOIP calling that is tracked by the system), however you’ll have to live with banner ads to use it. For other free CRM options, read the reviews in this Tech Republic post. The 18 Surprising CRM Statistics Slideshare presentation cites a study finding that CRM offers a $5.60 return for each dollar spent. With that kind of upside, and your time being the only investment needed, why wouldn’t you implement a CRM solution for your small business? Check-out one of the above entry-level CRM systems today. Image Credit: uau-customer-relationship-management by uauinfo, on Flickr.